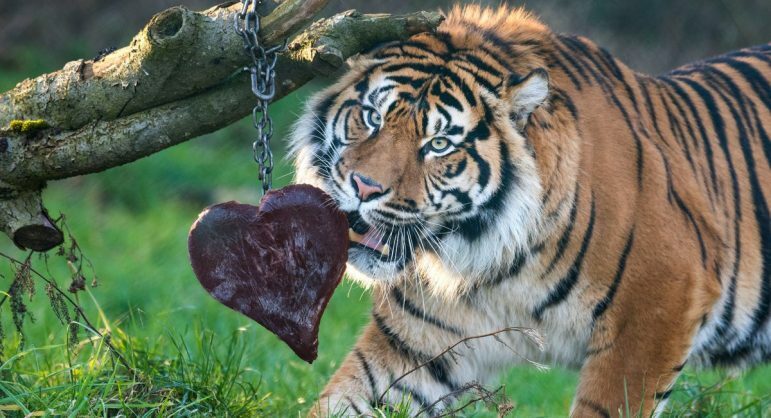 Sumatran tigers at West Midland Safari Park are celebrating Valentine’s Day with heart-themed enrichment. 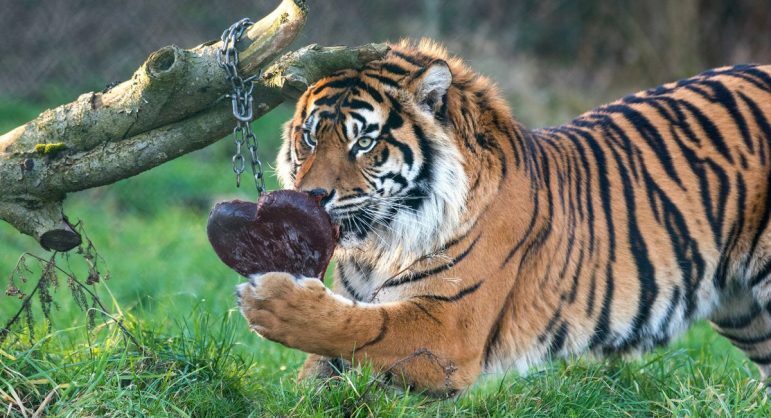 In hope of making a match made in heaven, keepers treated the couple to a heart-shaped and blood-filled frozen ice block. 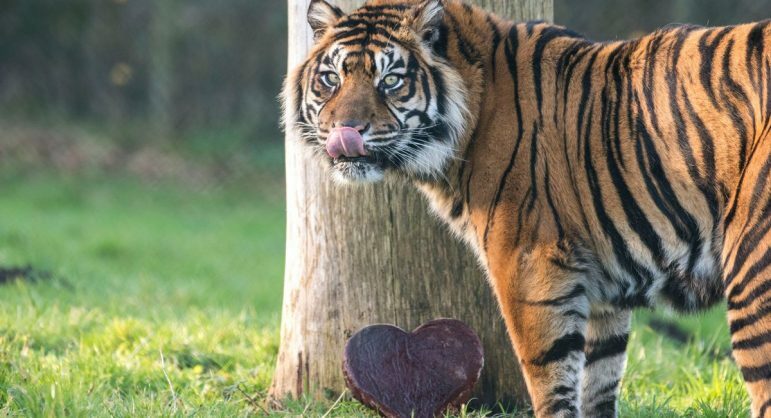 First to boldly approach the icy treat was 11 year old female, Hujan, who quickly took to playing with and licking the ice in an attempt to melt her companion’s heart. 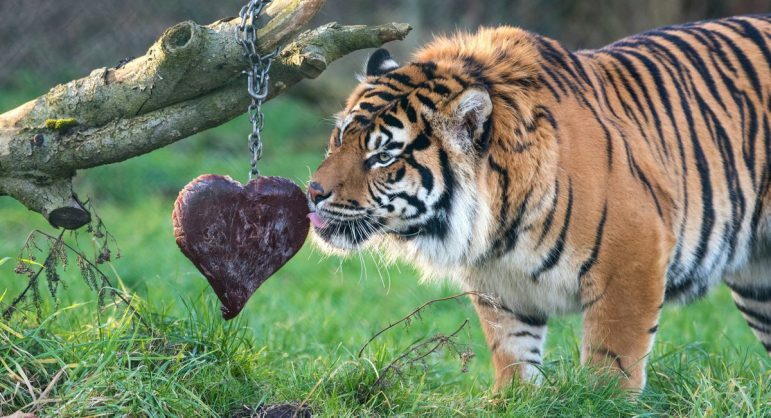 After initial reluctance, male tiger Nakal decided it was time to impress Hujan by jostling the heart with his huge paws. In the meantime, Hujan watched on with delight as her fellow companion enjoyed showing off his strength and vigour, which keepers hope will encourage the two to successfully breed. 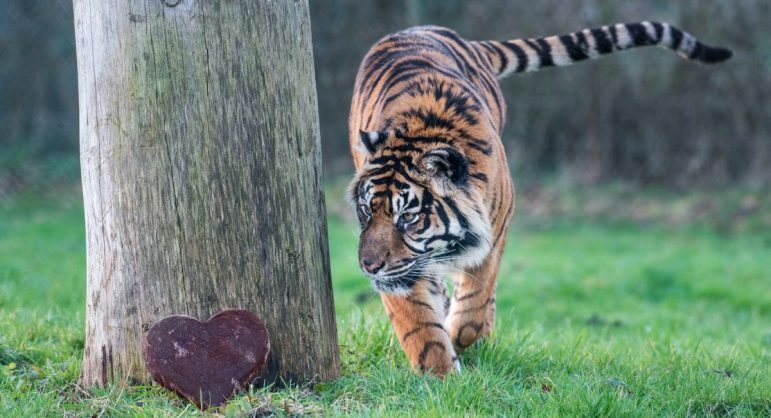 Carnivore Keeper, Holly Clayton-Wright, said, “Our Sumatran tigers are absolutely fantastic animals and we really hope that their Valentine’s enrichment will encourage them to become even more fond of each other. Although the enrichment treats are light-hearted, there is a much more serious side to the conservation of these beautiful animals. With as few as 400 Sumatran tigers left in the wild, they are currently classed as ‘critically endangered’ by the International Union for the Conservation of Nature (IUCN) and are at significant risk of becoming extinct in the near future. Exclusive to the Indonesian island of Sumatra, Sumatran tigers are the smallest sub-species of tiger. Although law enforcement and anti-poaching laws have been increased to protect them, there is still a large market for tiger products in Asia, which is having a devastating effect on the population of the species. Sumatran tigers are also suffering from loss of habitat; as much as half of the rainforest in Sumatra has been turned into agricultural land. Charities such as the Wildcat Conservation Alliance (WCA) work tirelessly to protect and conserve tigers by working with local government and environment agencies. 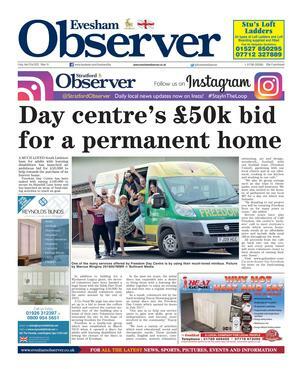 Protecting Tigers is one of the Safari Park’s conservation campaigns for 2018 and there will be an entire week dedicated to the conservation of tigers this summer. Various competitions and fundraising will take place during Tiger Week, with funds raised going directly to the WCA. 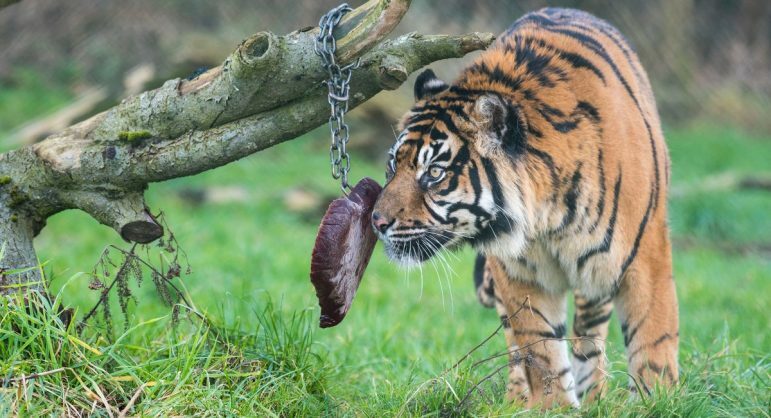 The Sumatran tigers can be seen in the four-mile safari, which is included in the standard admission charge of £24.00 for adults, £19.00 for children aged 3-15 and £22.00 for concessions. Admission includes a Free Return Ticket. Adventure Theme Park rides are charged extra. For the chance to meet the tigers, VIP Tiger Feeds are also available.